In 2010, two months after Appleâ€™s sale of the tablet iPad in Hong Kong, China, the licensed version of the product in mainland China was officially launched. Today, iPad2 sales between the two places are only separated by one week. Apple officials recently announced that iPad2 will be officially sold in Mainland China this Friday (May 6th). A week ago, this new product had just landed in the Hong Kong market. Since the price difference between the two is not large, the industry predicts that the large-scale "returns to goods shipments" that occurred after the Hong Kong iPads were listed on the market last year and the situation that Mainland visitors "shorted" Apple's Hong Kong online stores will ease. The parallel importers of iPad2, which are profitable, have far less time to earn a big difference than last year. According to Appleâ€™s latest quarterly financial report, its product sales in Greater China increased by almost 250%. On the other hand, according to Apple, its retail stores in China will surge from the current 4 to 25. More emphasis on the Chinese market, not only look at the objective data, but also from the details of Apple's strategy to see one or two. Copy the Jobs experience On last Friday, the Hong Kong version of the Apple iPad2 officially landed in its Hong Kong channel and official online store. Consistent with previous news, the sales price of iPad 2 for the Wi-Fi version was 3888-5488 Hong Kong dollars (approximately RMB 3,300-4,600). ), while the 3G version is 4888-6488 Hong Kong dollars (approximately RMB 4100-5460 or so). Until the Southern Metropolis Daily press release, Apple only announced that the mainland China version will be on sale this Friday, but did not disclose the price. However, according to the official price of a generation of iP ad, and Apple's pricing strategy for other iP ad 2 regions in the world, it is very likely that the Mainland's licensed products will continue to be priced. The prices of the 16GB, 32GB and 64GB versions are expected to be 3,988 yuan. , 4788 yuan and 5588 yuan. Like the first-generation iPad, the 3G version of iPad2 was missed in mainland China this time, and there is no timetable. So far, the 3G version of Apple's first-generation iPad has not yet officially sold in the mainland. It is understood that in order to allow Chinese consumers to get the most realistic experience when they come into contact with the iPad2, just after May Day, the licensed version of iPad2 in China has not yet officially listed, and Apple has conducted a small-scale experience for Chinese users. It is worth noting that the entire process is basically the â€œcopyâ€ of Appleâ€™s CEO Jobsâ€™ appearance on the iPad 2 release site on March 3rdâ€”the role of Appleâ€™s product manager replaced Steve Jobsâ€™s role in introducing iPad 2's hardware features and based on brand new Configuration of various applications. "iPad2 has a brand new design, some dramatic fast, we have a new processor A5. Dramatically thin, one-third lighter than a generation." Product managers based on the new features of the iPad 2 is introduced with Steve Jobs. At the time of the U.S. conference, the expression was exactly the same. This is the first time Apple has introduced new products in the Chinese market through this authentic "Joe" style. Prior to this, including the white iPhone 4 that had just been listed, Apple rarely carried out similar advance publishing work in other countries and regions. Some people think that Chinaâ€™s contribution to Appleâ€™s revenue has become more indispensable than the past and has become an indispensable heavyweight market. Competing for China's high-end cakes Although in the eyes of mobile phone manufacturers, China has a large number of grass-roots consumers, and it is an important entry-level sales market in the world. However, over the past year, Chinaâ€™s step-by-step sales and sales have made the entire industry see an invaluable "high-end cake." Throughout the 2010 fiscal year, Appleâ€™s total revenue in the Chinese market was $3 billion. In the first quarter of fiscal 2011, according to Appleâ€™s chief operating officer, Cook, the single-quarter revenue in China has reached 2.6 billion U.S. dollars, which is more than four times the same period in the previous year. In the second quarter of fiscal 2011, the figure rose to nearly 5 billion US dollars, accounting for about 10% of Apple's revenue. 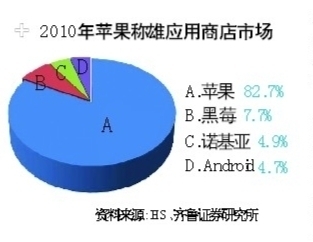 According to Apple China channel providers, iPhone 4 and iPad contributed most of them. In addition, the Southern Reporter was informed that Apple plans to accelerate the establishment of its own ground-based point-of-sale "Apple Retail Store" in China, which has rapidly increased from the current four to 25. Forbes also mentioned this point in the report, "Apple plans to add more stores in China, and most of its revenue comes from these retail stores." Apple's success in the high-end market in China, the "Nuggets", also touched the nerves of competitors. Motorola and Sony Ericsson have also targeted China's high-end market, and as fast as Apple will push high-end products released in Europe and the United States to the Chinese market. From the point of view of the Mainland's licensed goods, in the first generation of the iPad's landing in the Chinese market for a long time, its real competitor was Samsung's GALAXY TAB. With the passing of times, the environment of the iPad 2 is completely different. Although many brands that release tablets have not yet been mass-produced, iPad2â€™s opponents are much larger than their predecessors, the iPad. In addition to GALAXY TAB is still fighting in the market, Motorola XOOM dual-core tablet PC has entered the Chinese market with a price of 4999 yuan, the same price and storage space is similar to the 32GB iPad2, and supports 3G. On the other hand, Lenovo Music Pad, which has the highest level of domestically-made tablet PCs, has also been fully listed. Although hardware such as processors and XOOM and iPad 2 are not on the same level, their starting price of 3,499 yuan is quite competitive, and they also have a version supporting 3G. . In contrast, Jobs's process design and massive third-party applications are the advantages of the iPad 2.